A very decent number for an early start to the season – 27 entries with one nonstarter – Simon Durling. Iain Rowley brought 2 late entries – a gorgeous Volpini for Roger Woodbridge and the equally delectable Taraschi belonging to Aussie Nick Daunt. Westie Mitchell also nearly made it in the De Tomaso but a last minute dead battery and difficultly buying a replacement ended his valiant effort. 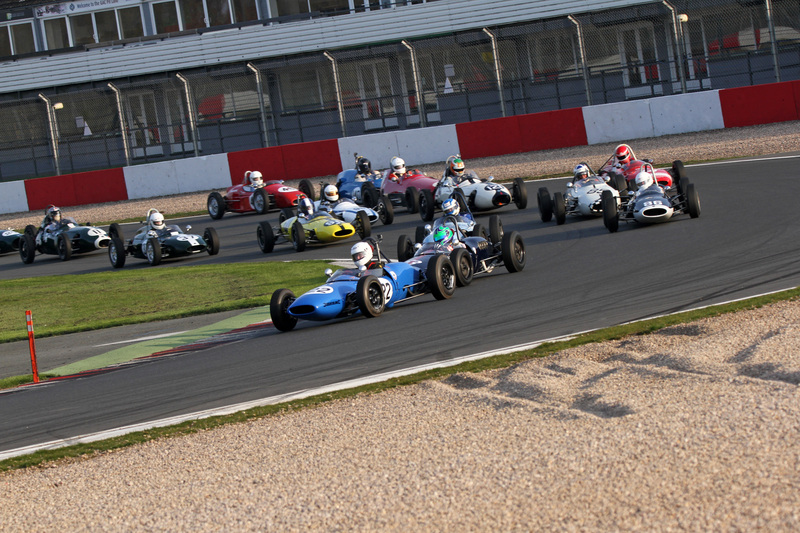 Most faces were “weel kent” but newcomers included Irishman Niall Murray in an Elva 100 with Elva Guru John Arnold in attendance, Keith Pickering, who made his debut end of 2018, in the smartly turned out ex Michael Ashley Brown Britannia and George Diffey, who raced occasionally a few years back, in Dad Simon’s gold Lotus 20- Simon was absent from duty on the spanners – no doubt basking in his recent success in the Pomeroy Trophy (it’s a sort of Automotive “Mornington Crescent”). 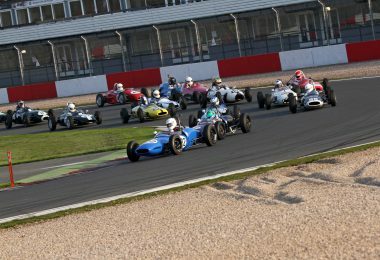 This went mostly as expected – well, sort of – Sam Wilson looked favourite but managed only 4 laps before a front wishbone failed – living fairly near, he and Dad Rob soon had an effective repair organised – his expected pole time was by a narrow margin of 0.4sec from the Adrian Russell ex Henri Grandsire Lotus 22 immaculate in French Blue. Steve Jones had his Cooper going really well for 3rd place bringing much joy to Cooper aficionado Peter Jackson reveling in a fine turnout of 6 Coopers. 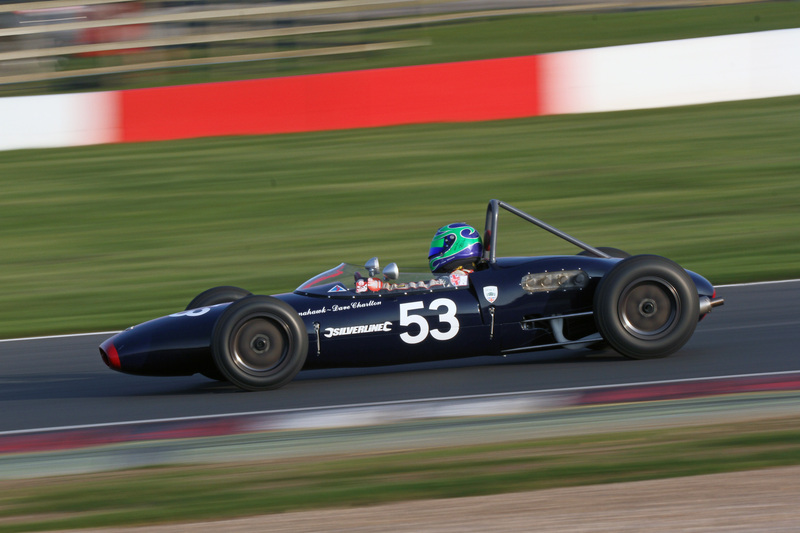 The front engined category produced a real surprise- Stuart Roach was favourite and duly went fastest of the “pullers” but only by a very small margin of 0.007sec from Niall Murray – further research revealed Niall to be a modern FF 1600 champion – he really enjoyed his first ever run in a historic race car – that’s the spirit! Chris Drake would no doubt have had his Terrier well in the mix but sadly his day was brought to a conclusion when his engine devoured a piston after 4 laps. Alex Morton lived up to expectations with a neat and quick drive but halted before the end of the session with severe gearchange problems – Alex was on his own but resolved a difficult diagnosis and even more difficult repair to the selector mechanism. Mark Haynes had fuel pump issues in the collecting area and did well to revive it albeit joining the fun late. 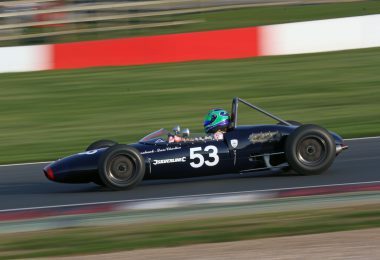 Andrew Turvey brought his Lola Mk5a to the pits, enveloped in steam following the loss of the water pump drive belt – easily replaced without undue drama. Frequent and very welcome visitor from Belgium- Tom De Gres did only a minimum of laps to qualify as 2 gears had gone AWOL – while the unfortunate Roger Woodbridge had the diff fail on the Volpini. Adrian Russell made a storming start, leading Sam Wilson into Redgate for the first time, behind, Stuart Roach kept his foot in round the outside to emerge in 3rd place. Sam Wilson was not to be denied and took the lead at Old Hairpin on lap 1. Thereafter he drew steadily away – over 30 seconds in front at the finish. There were similar large gaps throughout the first half of the field – despite Roach, Chisholm, Murray and Hayden recording very closely matched best laps. Roach made best use of his demon start to open a useful gap to his new rival Murray. Further down, Bill Grimshaw had a front bottom wishbone failure on his venerable Moorland which deposited him into the chicane gravel. Nick Taylor (Elva 100) and Crispian Besley (Cooper T56) entertained us with a spirited scrap, rounding Redgate side by side on frequent occasions – at the finish however, Taylor was well ahead – Besley having been back from the Class C leaders due to a lack of brakes. 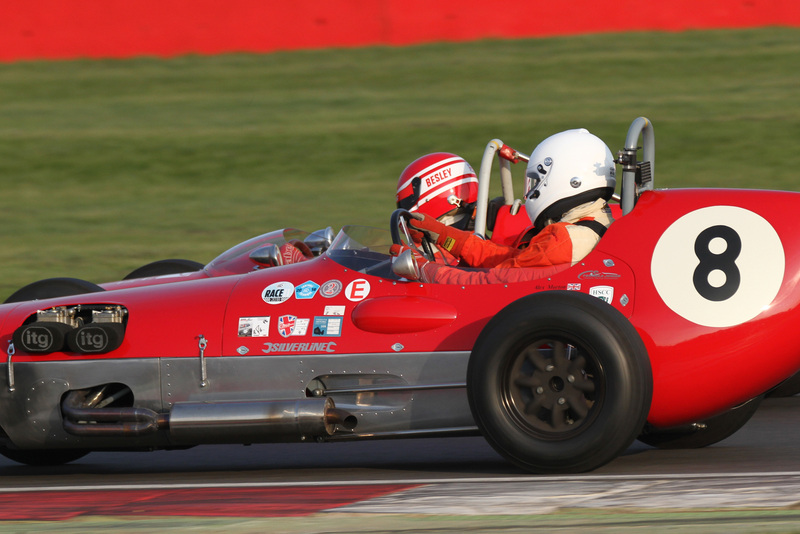 Keith Pickering had his Britannia going well, sadly at around half way, the left rear drive shaft failed and the flailing shaft did substantial collateral damage to chassis and bodywork – very similar to the spectacular failure on Gordon Wright’s similar Britannia at Cadwell last year. Further back was a grand dice involving Duncan Rabagliati, Iain Rowley and George Diffey. 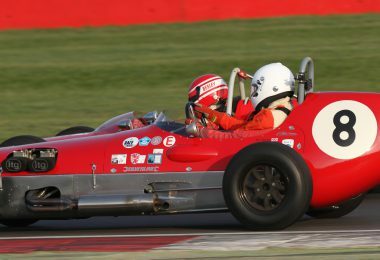 This was (I think) George’s first race – he declared that his aim was to keep out of trouble and especially to enjoy himself – he succeeded on all counts – keeping a close eye on his mirrors and making ample room for front runners to overtake safely when being lapped – definitely the right stuff, definitely the type we want in FJ and definitely inheriting the enthusiasm of his Father and for that matter his greatly missed Uncle James. So perhaps not the most thrilling of FJ races but a good start to the season and happily, totally devoid of any poor driving standards, car damage or anything even faintly resembling loutish behaviour – would expect nothing else – well done!